The Pony Platforming Project Holiday Special is better then it's predecessor in every way. I cannot stress this enough. This game took all of the original's issues, fixed them, and made what made the original good this game improved and polished. While I commented in my review of the previous game that the graphics were good looking, they are nothing compared to the Holiday Special's. The snow-filled environment is spectacular, the background (which is a little bland, in my opinion) actually scrolls, and the falling snow adds a lot to the game's overall appearance. The levels feel much more natural then before, which is a pleasant change. Unlike the first game, the in-game music is actually nice to listen to while playing, and I must admit, that boss battle music from the first game never gets old, and I'm glad that it was included in this version. The level design has also improved a lot, and I no longer experienced a feeling of déjà vu from repetitive level design, which was a pleasant change. It may have had something to do with the fact that the levels are now shorter; a fact that made reviewing this game far easier. Sprague seems to have found the perfect level length: not too long, yet at the same time not too short either. The game is also far more stable then it's predecessor, and while it's not completely free from bugs, it's a big improvement from before. As with the last game, the game ends with a boss fight. While I'm not going to spoil it for you, I will tell you that it is far better then that fight with Momma Owlbear. It has an epic feel, and even though it's far too easy to beat I still say that I enjoy the fight every time I play the game. The animated background for the second half of the fight is very well done, and I seriously think that Mark Sprague could get hired at DHX Media to work on the actual show if he ever applied for a job there. 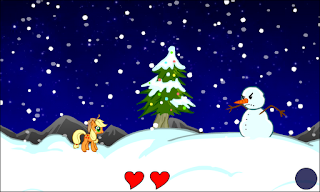 When I first booted up the game, I was expecting a palette swap of the Pony Platforming Project, with snow instead of grass, same old music and recolours of the monsters. Not so. Instead, what I found was an even better, highly polished game that was better then it's predecessor in every way, and hands-down the greatest released My Little Pony:Friendship is Magic game ever released, period. While it's not perfect and future games may take the crown, it's managed to overshadow anything released up to this point by it's sheer polish.